Richmond Chemical Works near Philadelphia. [graphic] : N. Lennig & Co. Offer for sale / Drawn engr. on stone by A. Kollner No. 6 Bank Alley. Title: Richmond Chemical Works near Philadelphia. [graphic] : N. Lennig & Co. Offer for sale / Drawn engr. on stone by A. Kollner No. 6 Bank Alley. 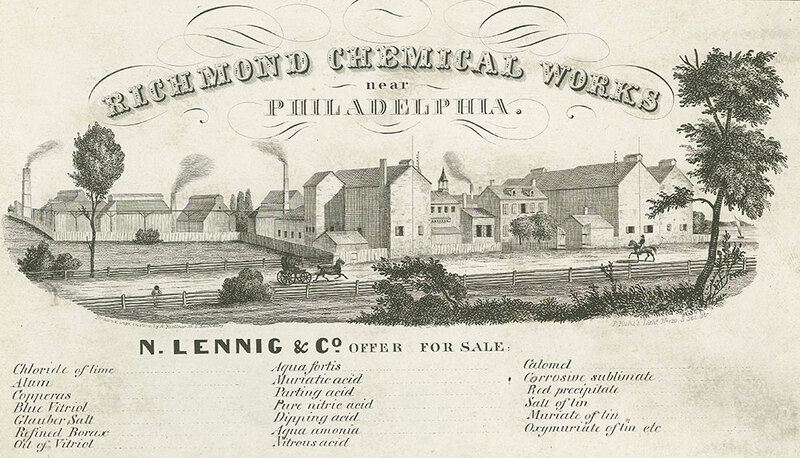 Advertisement card showing a view of the large chemical works for N. Lennig & Co., also known as Tacony Chemical Works, established in 1831 at Richmond and Ann streets in Port Richmond. Several of the buildings contain smokestacks, and most are absent or only contain a few windows. In the foreground, a man leans on a fence lining the road, while behind him, a horse-drawn carriage and man on horseback travel in front of the complex. Also contains a list of 20 chemicals produced by the factory, including Chloride of lime, Aqua fortis, and Muriate of tin, printed below the image. The works ceased operations circa 1848 following the relocation of the plant to Bridesburg beginning in 1847. Kollner operated from 6 Bank Alley in 1844.